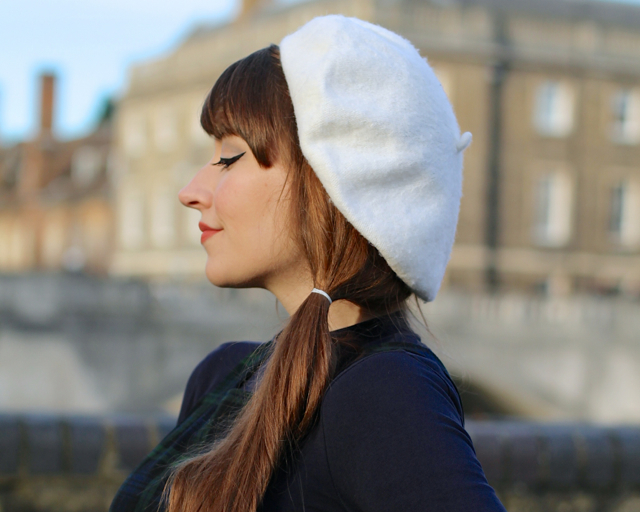 It’s no secret that I adore berets and they might just be one of the very few things I actually like about winter. When the warmer months roll round again, after so much time living in these hats at the weekend, I find myself having to re-learn how to style my hair again without having a beret to fall back on if it all goes a bit wrong. I think of this as a more 50s ‘do for its elegant, feminine look that is very much built around the hat and the fact it’s quite glamorous. This is also easier to do once the beret is already on so you can position the bun correctly and not, like I once did, find I’d done the bun too high meaning the beret couldn’t sit on my head! Why the strange time guidelines? Well, this bun can be achieved in one of two ways. Once you’ve made a low side pony that is around the height of the middle of your ear and tied towards the back of the side of your head (where the centre of my bun is above), you have two choices: 1) you could use a hair donut to achieve this kind of volume, which is much easier to do with hair much shorter than mine or 2) you can make rolls of hair about 3cm wide and pin them in stages all around the centre point (the hair tie) until you get the above. The latter is far more fiddly, but I don’t find it easy to use hair donuts with such long hair. Oh, this one is so super easy and looks so cute and mod, don’tcha think? Anyway, who can resist this simple, yet oh-so-darling pony with a hat? 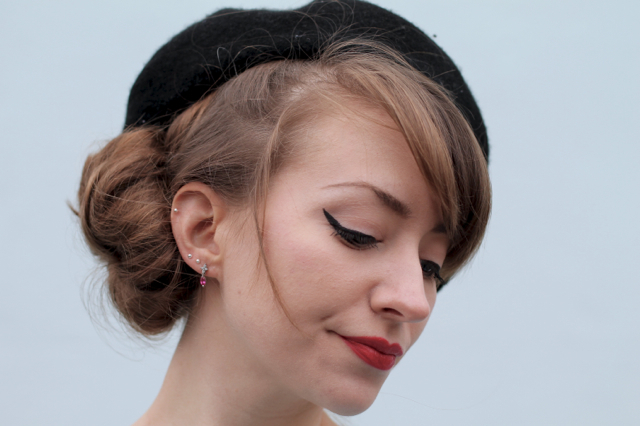 I surely don’t need to explain how to do this one, as it’s literally just tying your hair in a low side pony and whacking a beret on your head. Well, not literally whacking as that might hurt, but that’s about how complicated this is. I don’t even straighten my hair first, just blow dry it roughly straight, with some of its natural wave coming through. Sometimes I’ll give the pony a bit of backcombing to make it look a bit fuller. And ta-da! Stylish, but a monkey could do it. There’s a lot of pictures of Twiggy with a big ol’ plait in the 60s, so I’m going with that as my retro inspiration, but the truth is I just really like plaits, particularly paired with berets. 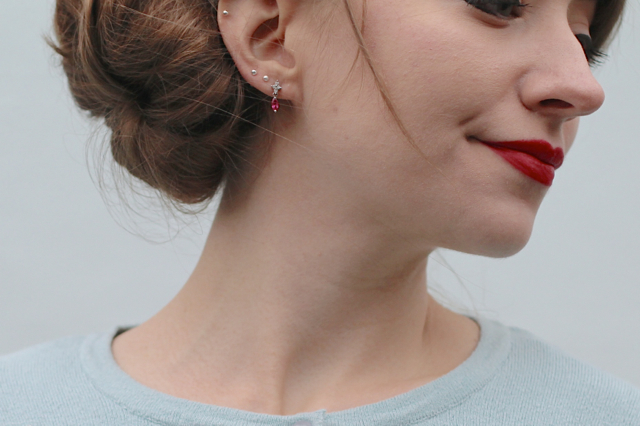 Not only does the above look cute, but it’s super fast and easy to do because you just plait your hair to the side of your head and then put a beret on top. It literally couldn’t be any easier (unless you’re doing the ponytail above). 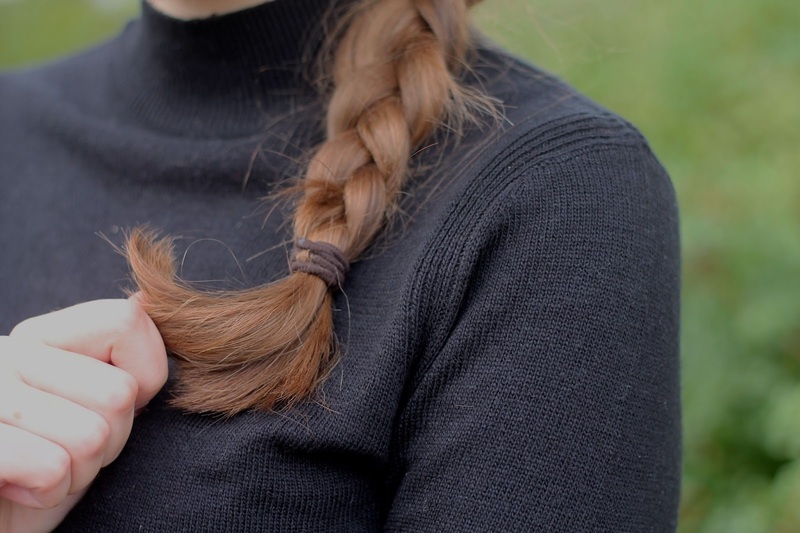 This style is going to work better if you have hair down past your shoulders like I do, as once you plait hair to the side like this it springs up a bit and I think the longer the plait, the better it looks. But that could just be my opinion and if you can plait it to the side you can do it! In the winter, this is my go-to lazy-hair day look. Oh and here’s a bonus photo of what I was talking about the start – simply on top of loose, curled (the ends in this case as that’s about what I can do) hair. I never shared this outfit set, taken late in 2014, but sometimes that’s the way it goes… Bonus points if you spotted that this dress is also featured in one of the above looks! Got any tips for other ways to wear berets? 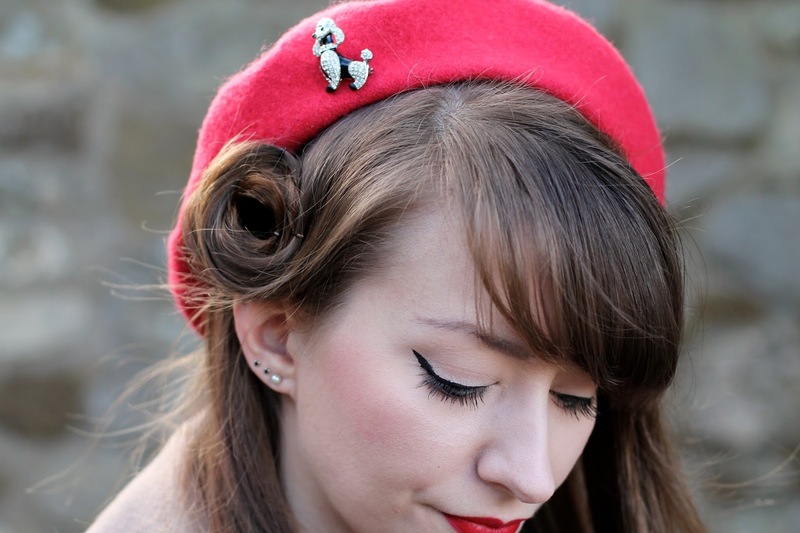 Good beret hair tips, I like the little side pony, very cute! I've never got on with buns to be honest. I have one of those doughnut things but my hair's probably a tad too short now to use it properly. Hmm, maybe an experiment for the weekend. I do wear berets quite a lot, I've had one on today in fact. I rarely make much hair effort with them though, must try harder! Oh gosh, this is going to sound weird, but I dreamt about you again last night. It's getting to be embarrassing now. Your man was in it too, and he had ordered a rather large quantity of cake and a bottle of champagne. I'm so sorry, I can't control my subconscious!! If it's any consolation, I have very outlandish dreams all the time, featuring pretty much anybody I've ever met, and people I haven't, like the Queen. Nice to see some easy looks, most vintage looks are complicated and time consuming, and can end in a very aggressive tantrum with pins everywhere. Tee hee hee! I love the side bun, one of my personal go to styles. Also never thought of putting on the beret first, but it makes total sense!!! Love all these! Plaits are definitely a favourite of mine though. I love berets and have tons of them. When my hair was long I only ever wore them with my hair in a side ponytail as shown in your third example but I wish I'd played with it more now. I think I actually wear it in more styles now that it's short as it's easier to manage though. I was definitely a lot lazier with my hair when it was short; having it this long I have to find ways to get it out of my face on windy days!! Nice tips, I could use this with some of my other hats. Well,not the victory roll thingy, but others would work well. 🙂 I also have too much hair that just will never stay curled. I don't really see the point of curling it for 2hours when it's gone in 30 minutes (in the winter). On some very rare occasions (=when I burned my hair into curls) my curls have lasted for a whole 2 days and I've never been so happy, but I didn't make them myself, my cousin did. In my case the only way to get lasting curls is to have someone else curl them. If you can wear a hat on the side you can get a roll in 😉 I have the same problem with curls because of the length of my hair, which is another reason I find creative ways to make it look like it's in a style without going near rollers! I love your mini hair tutorials as I am so bad at hair, things like them seem possibly achievable! I'd love to have more vintage hair this year. These are all so pretty! I love how they are fairly simple to achieve, I wish I had long hair!! Also I tried to take your advice about going to the kid section for a beret, and I'm popping into kid stores every chance I get to try to find one! These are all great hairstyles and seem achievable to me which is important as I am rubbish at hair do's. I have never managed to make a beret look good on me but I will try again with these ideas. Very glad to help 🙂 I find that asymmetrical hairstyles are often best on me, so once I worked that out I ended up with the above eventually! These are each so wonderfully pretty and powerfully classic. I usually wear my hair either pulled half back (with a barrette, ribbon, etc) or all gathered in a low pony at the nape of my neck when I sport a beret, though do sometimes fluff up my curls and channel a bit of a Veronica Lake vibe by letting them flow freely around my beret. Big hugs & endlessly happy Valentine's wishes, my darling friend! Very pretty! I think the first two looks are my favorites. 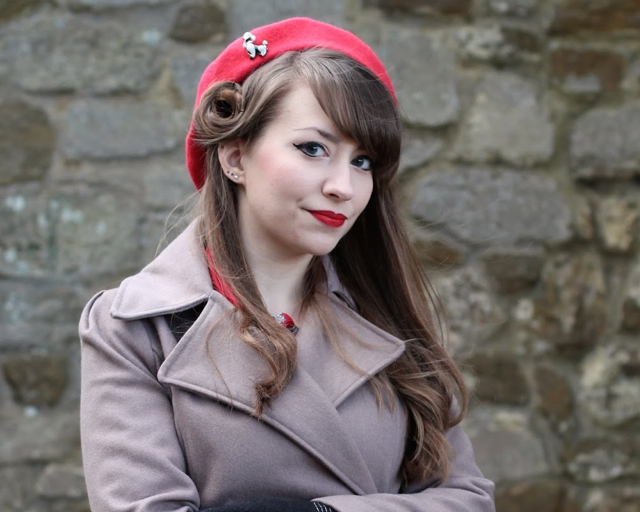 They work really well with the beret, and don't require the level of smoothness or finishing that 40s and 50s inspired updos usually do, because you've got the hat. I think I still have a beret somewhere, I'll have to dig it out and see if I can convince my hair to do any of these things. Exactly – and I am all about getting out of the finishing that 40s and 50s styles so often need!! 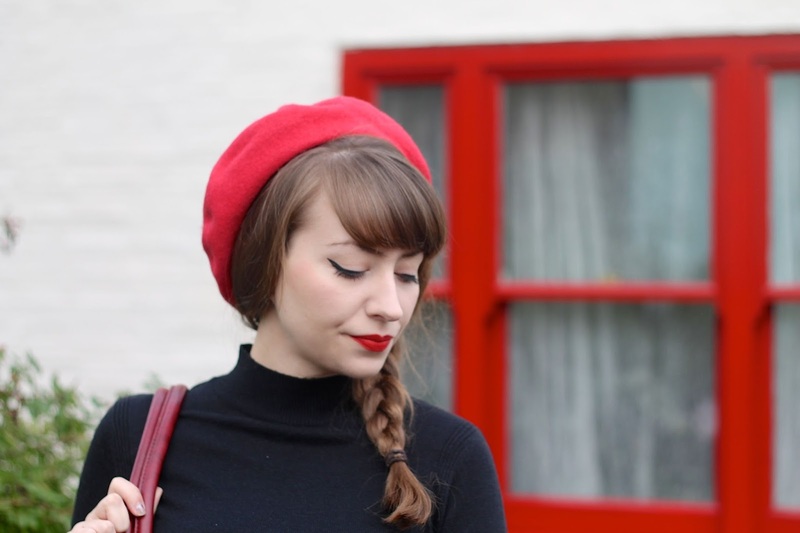 When I had a bob with no fringe I used to layer 2 or 3 flat pincurls on the side of my head and then cover the rest with a beret. It created a 1930s style look. Big bumper betty bangs look good with a beret too! 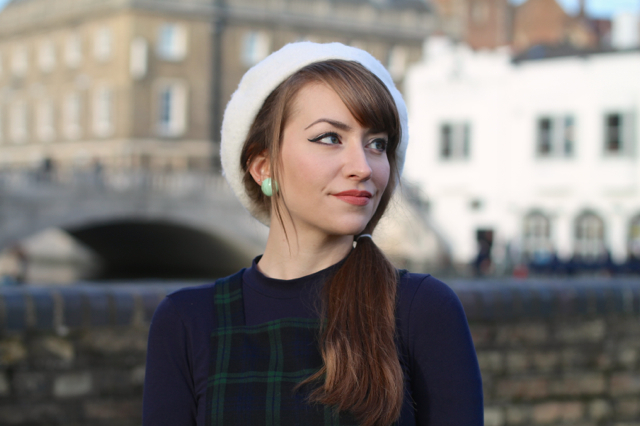 I am just always on the watch for a new beret, like some weird beret obsessive… Oh wait, that basically is what I am!